In this trial women between the ages of orlistat blue pill 35 and..
Eyepieces Widefield Eyepieces WF 10X or 15X. Observation Head Straight Binocular head with interpupillary adjustment fittrd on a pole type stand. Observation Head Binocular head inclined at 45-deg. with adjustable inter-pupillary distance. Focussing By Rack and Pinion mechanism. Objectives 2 sets of objectives 2X and 4X, selected by sliding nosepiece. Eyepieces Standard extra wide field eyepieces WF-10X or 15X are provided. Model ASM-2B Same as Model ASM-2A but with trans-illumination base suitable for artificial and transmitted light arrangement and elbow hand rest. Model ASM-2C Same as Model ASM-2A but with stable base provided with built-in illumination both for incident (EPI) light and sub-stage (transmitted) light fo individual or simultaneous use, for 6V-20W halogen lamp. Base Fitted on transillumination base suitable for artificial and transmitted arrangement and elbow hand rest. Observation Head Binocular head inclined at 45-deg., rotated through 360-deg with adjustable inter-pupillary distance. Focussing By Rack and Pinion mechanism with adjustable tension collar. Illumination With integral illuminator, 2 lamps are fitted to provide both transmitted and incident illumination. Objectives 2 sets of objectives 2X and 4X, selected by rotating nosepiece through 90-degrees. Eyepieces Standard extra wide field eyepieces WF-10X is provided. 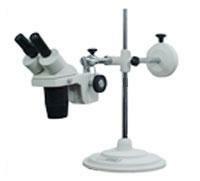 It is a multipurpose microscope equipped with a universal base stand. The vertical & horizontal movement of arm makes it convenient for observation of the objects at a desired angle. Supplied with following Optics in cardboard box. Magnification : 20x to 60x. ZM-2 Auxillary Objective: 0.5X & 2X for Stereo Zoom Microscopes. ZM-5 High Intensity Flourescent Ring Illuminator: with circular flourescent tube & power supply. ZM-6 Space circular flourescent tube: High intensity circular tube for illuminator. ZM-9 Polarising Attachment: for examination of geological specimen under polarised light. SI-7 Incident Halogen Illuminator: Spot light halogen illumination for Stereo Microscopes.